Our Shropshire-based firm that’s been in business for over 140 years has seen some major staff changes over the summer. 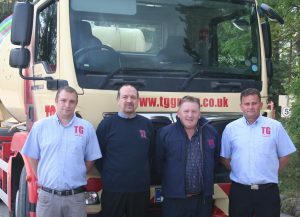 Tudor Griffiths Group’s concrete division is preparing for a busy final quarter of the year, and TG Concrete General Manager Dave Morris said the new-look team was raring to go. “We’ve said goodbye to Martin Rogers, who has been a key member of our team for almost 30 years, and who has now retired from his role as manager of the despatch office. Martin will be sadly missed by customers and staff alike, and even though many customers have never met him in person, many people have said how professional and helpful he has been. Peter Strachan is now following in Martin’s footsteps in the despatch office and he will be the person liaising directly with all trade customers when it comes to placing and fulfilling orders. 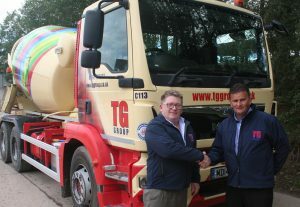 There’s a new face in the TG Concrete sales team too, where Chris Kilvert has taken on the role of Area Sales Manager, focusing on the Chester, Wrexham, and north Shropshire area. Chris, who is originally from Four Crosses and now lives in Oswestry, has over 30 years’ experience in the Readymix concrete industry, and has spent the past nine years working in the Middle East in the oil and gas sectors, and supporting infrastructure projects in preparation for the 2022 World Cup in Qatar. He has also worked in India, Nepal, Sri Lanka and the Philippines, and holds various industry-recognised qualifications, as well as being a member of the Institute of Occupational Safety and Health.